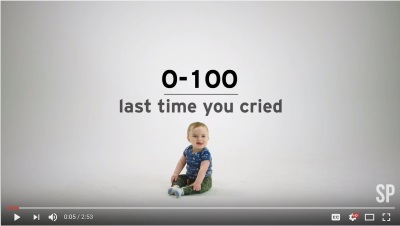 Dr. DeFoore's Healing Anger Newsletter entitled "Only The Strong Ones Cry"
How Does Crying Help With Anger? There are always hurt emotions buried in and behind anger. When these emotions are released through crying, it can help anywhere from a little to a lot with healing the anger. It takes more courage to cry than to get angry. I know, that might be hard for you to swallow, but it's really true. Ask anybody you know who has any kind of anger which they'd rather do...cry or get angry...I bet they will say that they'd rather get angry. Your greatest and deepest need is to love and be loved, and that makes you vulnerable. That means you can be hurt...and we all are hurt in some way as children. Naturally, you will be afraid of getting hurt again. This is natural. Feeling vulnerable, hurt and afraid creates a feeling of helplessness, and nobody likes feeling helpless. This is where the anger comes in. Anger feels like power and usually leads to some kind of action, which gets you out of the helpless feeling. Anger seems like the solution to the problem of helplessness, but it usually only creates new pain, fear and helpless feelings. When you feel safe and open enough to let go and cry, you're actually getting back to the original cause of the problem...you needed love, safety and protection, and you got hurt (abused, neglected or abandoned). When you have a good crying release, you are really doing the work, whereas the anger is more on the surface, creating a distraction from the pain. This is what I mean by, "only the strong ones cry." "The ability to cry and release deep, painful and even joyful emotions is a sign of good health and emotional strength." Some of the best crying release occurs in moments of joy and relief, which is when we talk about "tears of joy." Because it's hard for some of us to cry, we'll go into some specific skills below that will help you get the release you need. One of the best ways to feel safe enough to release deep emotion and heal is with support and encouragement from others. That's why we created the Goodfinding Community Online page. Now let's look at some specific skills you can use to help you release your emotions through crying. Sometimes it's just hard to cry. The deeper your pain, and the longer it's been locked away, the harder it is to gain access to those emotions. 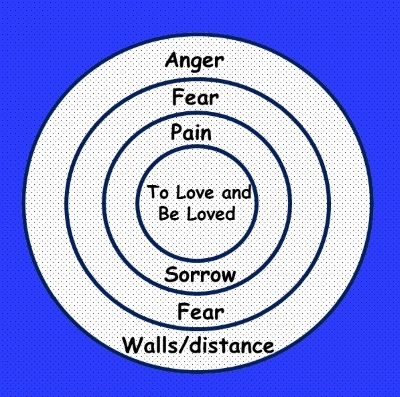 In the image above, you can see that pain and sorrow are the closest to the need to love and be loved, whereas fear and anger are a little farther away from the center, but closer to the surface. That's why for most of us it's easier to get mad than to truly feel our sorrow. These emotions actually live more in your body than in your mind...that's why stuffing them down can sometimes make you anxious, depressed and/or physically ill. And that's why we're going to recommend some physical release techniques below. Journal about the greatest love you've ever felt, starting in early childhood and moving forward to the present. Then write about the ways you've been hurt through neglect, abuse and abandonment. This can be challenging, so take a look at these basic emotional needs to get a better idea of ways you may have been hurt through neglect. Get out photographs, cards and letters of loved ones you've lost, or the ones you're focusing your emotions on. Use physical posturing, such as getting into the fetal position, or the child yoga pose (see image to the right). This can be very helpful in sending a signal to your body that you're ready for emotional release. Finally, use vocal release techniques such as softly moaning, or even wailing if it feels right. Of course, you need privacy for this, so that you don't have to worry about anyone hearing you or interrupting you. I know this does not sound like fun...but it's a lot better than just living with the anxiety, depression, anger and illness that results from keeping old pain and sorrow locked away inside. Set a designated time for this type of exercise, and make up your mind to do it for anywhere from 15 minutes to an hour at most. Then put everything away, wash your face and go back to living your life...hopefully feeling a little or a lot lighter. 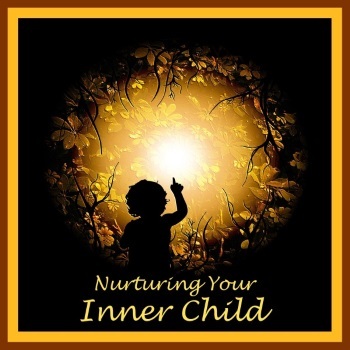 This highly effective audio program, available as a CD or MP3 download, will help you understand and heal your deep inner emotions, and create lasting joy and love for yourself and those around you. New web pages for you. Read new contributions from good folks like you, such as New Husband Terrible Problems by a woman married only 4 years, and finding that her husband has a drinking problem, and Trying And Failing Miserably by a woman concerned about her own and her husband's anger.